Q+A with Nelson Piquet Jr. 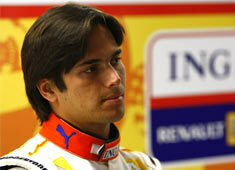 Despite the doubt of many fans that Piquet would return this year in a Renault, Nelsinho is still here. Renault is confident that his progress towards the end of the season will continue this year and show he is a capable driver to support Fernando Alonso. Well, it’s been a lot of hard work. Fernando has been in F1 for several years and he’s the top of the tops, so I had to learn quickly. I had to try and reach my best at every track, and every track was a new situation; a new thing I was facing. I had to adapt myself to it and generally by the end of the weekend I was nearly on a par with Fernando. Then a new weekend started and everything was back to zero – new track and getting used to things again, having to take it corner by corner… Comparing the beginning of the season to the end, tracks that I didn’t know at the end I learned much quicker than at the start of the season. I was more confident and I knew how to work around the problems much better than at the beginning. I certainly learned a lot and made a lot of progress last year. I will therefore be much sharper this season. For every driver on the grid, 2009 is going to be another learning process because of the new regulations. From what you’ve seen so far, how can you describe the behaviour of the 2009 cars? A lot of things are changing: new tyres, new aero package, the KERS system… Everything is going to be new for us and the start of the season should be very interesting. I think the driver who works hardest and can adapt quickly to the new rules is going to have an advantage. With the return of slicks, do you feel that your GP2 experience will give you an advantage, or is it going to be the same for all the drivers? I think it’s going to be the same. For the drivers it doesn’t make a difference: the only thing is it might give a bit more mechanical grip. Also, we’re going to have less wing on the car, less aerodynamics, so it’s going to be different to what I was used to in GP2. I don’t think a slick tyre and one with grooves is going to help or take an advantage away from some of the drivers. The cars should be sliding a bit more: is it something that suits your driving style? Is it something you like? Yeah. It’s always fun to be sliding, but logic says that the quickest way is never sliding; the quickest way is always to be on the perfect line. Still, it’s going to allow us to slide a bit more. The way the team developed the car over 2008 was quite impressive. Does it mean you can start 2009 strongly as well? I hope so! I know this season will be easier for me as I’m feeling much more comfortable in the team, I know the circuits and how to approach a Grand Prix weekend. I’m sure it’s going to be much easier for me to handle everything. I’m going to start 2009 where I left off in 2008 and determined to improve race by race. What is the atmosphere like in Enstone and Viry at the moment? The team is even more motivated. The performance of the team at the end of 2008 was very important, Fernando is committed to the team, and everybody is optimistic at the moment. We must keep up this determination, remain focussed on our winter development programme and I’m sure we will be in a strong position in 2009. Have you set yourself any kind of personal targets for 2009? I would love to be in the top five in the drivers’ championship. That would be excellent, but obviously it’s going to depend on what the car is like. What’s it like working with Fernando? We have a very good working relationship and we always have the same answers to the problems that we encounter. We always agree on the same things; we always have the same ideas, so I reckon that helps the team with the development of the car.